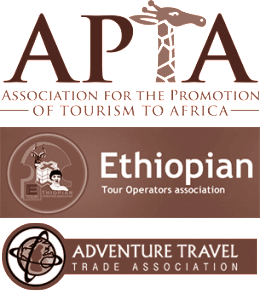 The Ancient Kingdom tour is a wonderful way to really grasp the breadth and beauty of Ethiopia, a journey through history via the byways of the old empire. The historical highlights, Lalibela and Gondar are fascinating glimpses of past cultures, and the Simien mountains are awe-inspiring. In addition, the trip provides a close-up look at life in Ethiopia, with some experiences very warm and touching, like being offered a coffee ceremony in a mud hut. Entrance fees, guides, ground transportation, meals and all hotels. Domestic flights are not included. $3,238.00. International and domestic flights are not included. 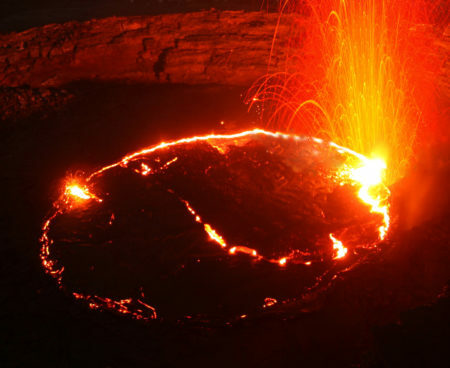 Board your early morning flight to Bahir Dar and drive to the small town of Tiss Abay to visit the Blue Nile Falls, locally known as Tis Isat or 'Smoke of Fire'.Even though much of the water has been diverted to power local hydroelectric generators, the Falls is still an intriguing sight. 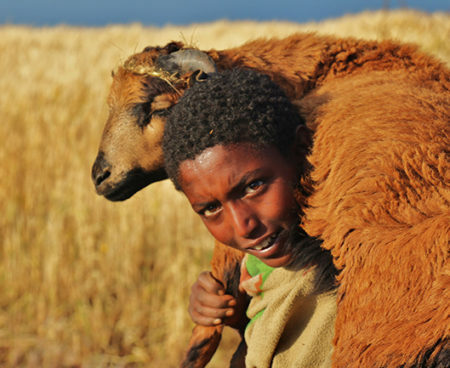 The surrounding area is extremely fertile and the Amhara people who live here farm wheat, sorghum and teff, the prime ingredient for making injera, the national bread and increasingly popular, gluten-free super-food you may have heard of back in your home contry. Visit the market in Bahir Dar, where you can see colourful woven clothing, basketry, cereals, spices and other local goods. 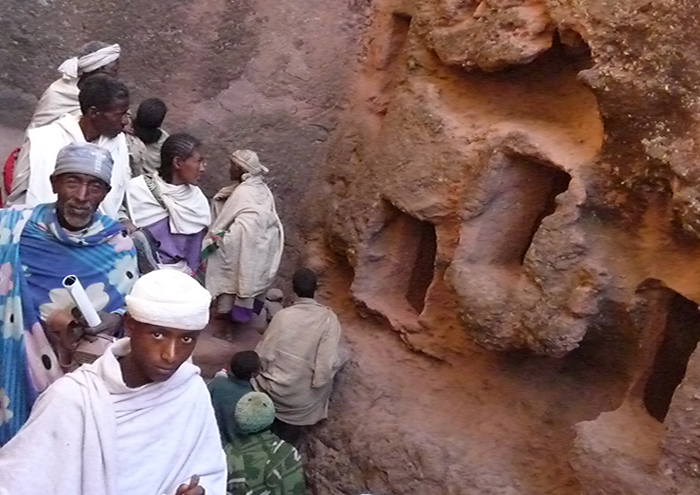 Opt to climb up to Bezawit, the palace of Haile Selassie which lies on a hill 5km outside of Bahir Dar. The panoramic views of the Blue Nile River, Lake Tana and the town are beautiful. After breakfast board a cruise vessel on Lake Tana to visit the ancient monasteries. 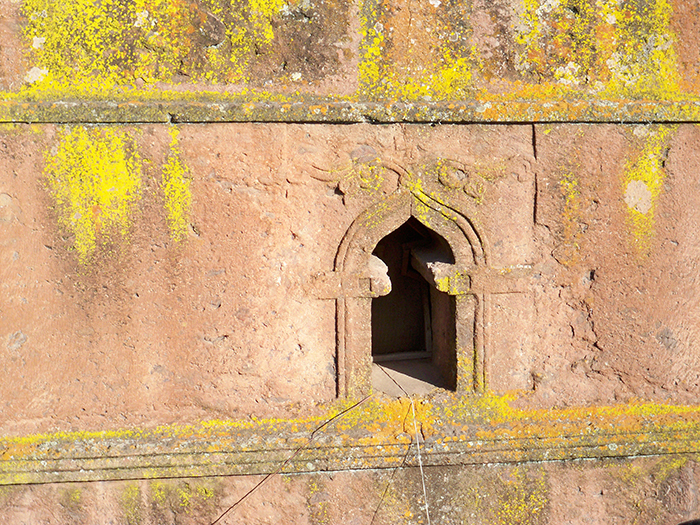 Visit three monasteries on Lake Tana. 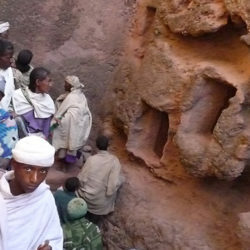 Both men and women can visit the first monastery, Ura Kidane Mihret. Near Ura Kidane Mihret is a traditional house museum that we will visit, along with two island monasteries, Kibran Gabriel and Entos Eyesus. Kibran Gabriel can only be visited by men, so while the men are visiting that one, the women will visit the neighboring Entos Eyesus. 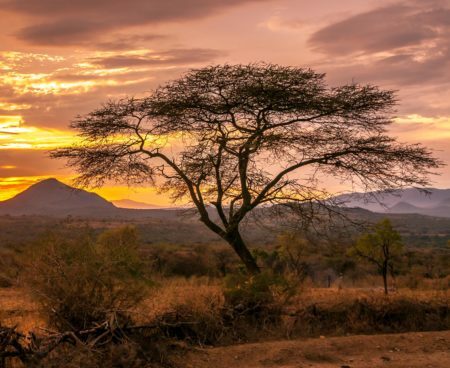 Enjoy a scenic drive (110 miles) to the ancient Imperial city, traveling through a fertile landscape of wide open fields; a perfect African tableau punctuated by undulating hillsides and valleys. Gondar is the former imperial capital, founded in the 17th century by Emperor Fassiledes. Fassiledes and the five emperors after him each built their own respective palaces and churches, giving rise to Gondar’s nickname; “Camelot of Africa”. Visit the royal enclosure containing six castles, a complex network of connecting tunnels and raised walkways. 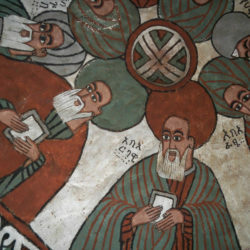 Proceed to the fascinating Debre Birhan Selassie Church, whose walls and ceiling are decorated with scenes of Biblical lore and medieval history. Travel 60 miles to the principal mountain massifs of Africa, the Simien Mountains. On arrival at the headquarters of Simien Mountains National Park, meet our trekking scout and guide and transfer to the Simien Lodge. This afternoon enjoy a three to four hour relaxing trek to explore the beauty of this mountain range, which includes several plateaus separated by broad river valleys and a number of peaks that rise above 13,000 feet. 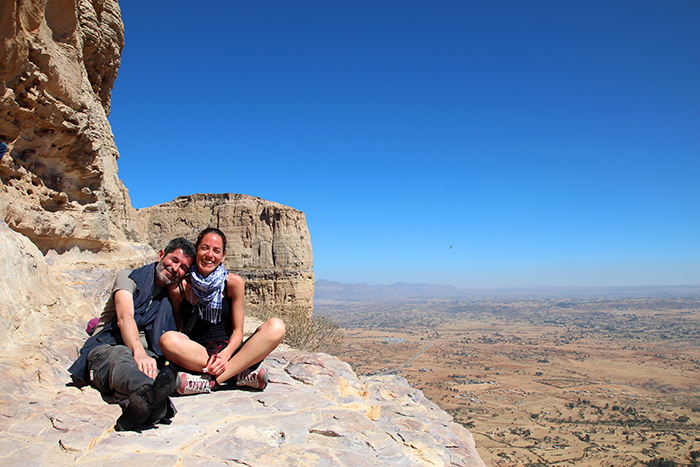 The sights are impressive and an excellent chance to see herds of Ethiopian Baboons. 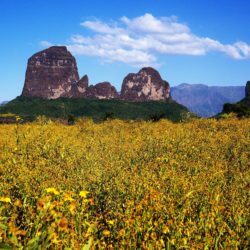 Enjoy a full day visit of the Simien Mountains National Park. 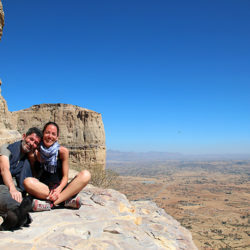 In the morning we hike from Sankaber campsite to the Jinbar waterfalls before driving as far as Chenek campsite for a picnic lunch and short excursions in search of Walia Ibex and the Ethiopian wolf. Return to Simien Lodge for the evening. Drive 175 miles through the mountain range offering extraordinary scenery of the Simiens as we descend towards the Tekeze Gorge. This scenic drive takes us from a height of 10,200 feet down to 4,600 feet. Drive through small villages dotted between the mountain massifs, where people somehow eke out an existence in this unforgiving countryside. Drive through the Tekeze valley into Axum. This is the heart of ancient Ethiopia, the capital of the Kingdom of Axum which was the most powerful state between the Eastern Roman Empire and Persia. The archaeological and historical attractions in Axum include monolithic steles or obelisks, the tombs of King Kaleb and King Gebre Meskal, the legendary Bath of the Queen of Sheba, and the ruins of her ancient palace. Also visit the new and the old Cathedral of St Mary of Tsion (Zion) and the sanctuary that houses the original Arc of the Covenant. 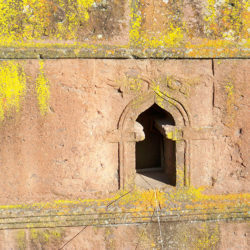 The older of the two cathedrals, built in the 16th century, is believed to be built on the ruins of an earlier 4th century church, and is the holiest site in Ethiopia. Visit the historical town of Adwa in which a decisive 1896 battle the Ethiopian army commanded by Emperor Menelik II defeated the Italians, dashing any hope they had to colonize Ethiopia. Continue to Yeha, a small village to view ancient ruins ( 5th century B.C.) 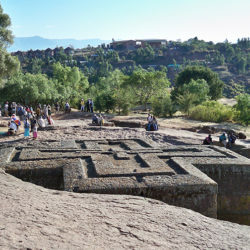 of a large pre-Christian temple, believed to be the oldest standing building in Ethiopia. Also on the temple grounds is the 6th century A.D church of Aba Aftse, dedicated to one of the nine saints who migrated from Syria and introduced Christianity to this area. The Gheralta Range is home to a treasure trove of rock churches, which are carved into the sandstone buttes. This morning trek for 45 minutes to the top of an escarpment to visit the church of Debretsion; its domes and the wall panels are abundantly decorated with fine paintings of saints and apostles. 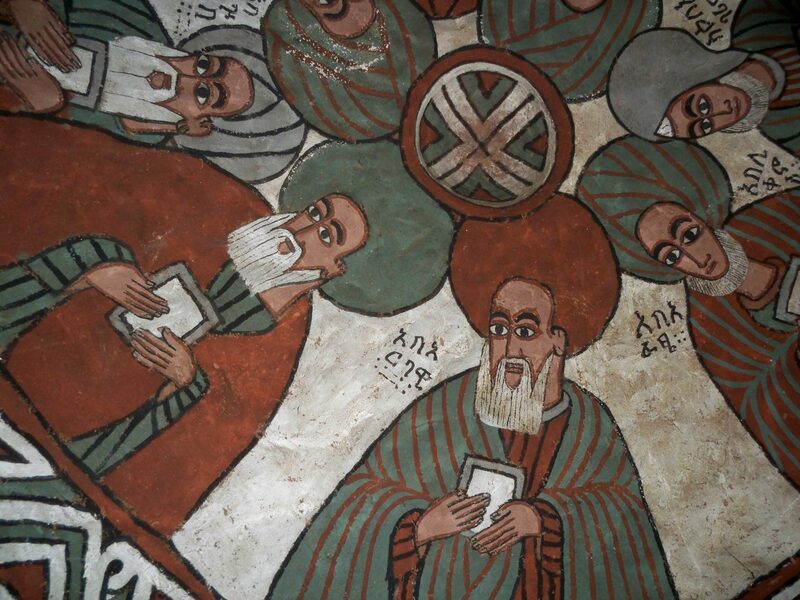 After lunch, we will visit the rock church of Abraha Atsbeha, dedicated to the twin kings of the Axumite dynasty, who converted to Christianity in the 4th century. Continue to Mekelle, visiting the town of Werkro to view the rock church of Wekro Cherkos. 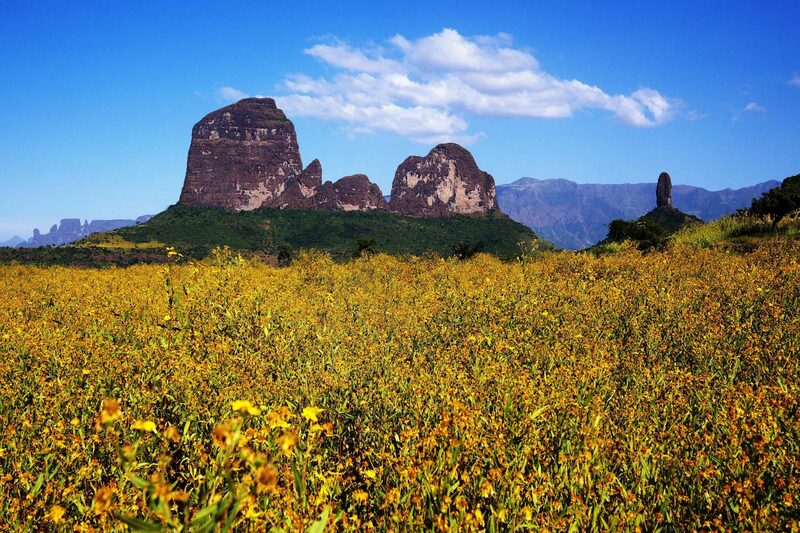 Enjoy a relaxing scenic drive through the Tigray landscape and appreciate the abundant evidence of why Ethiopia is the most mountainous country in Africa. Visit Lake Ashenge a magnificent area to view the indigenous bird life of Ethiopia. 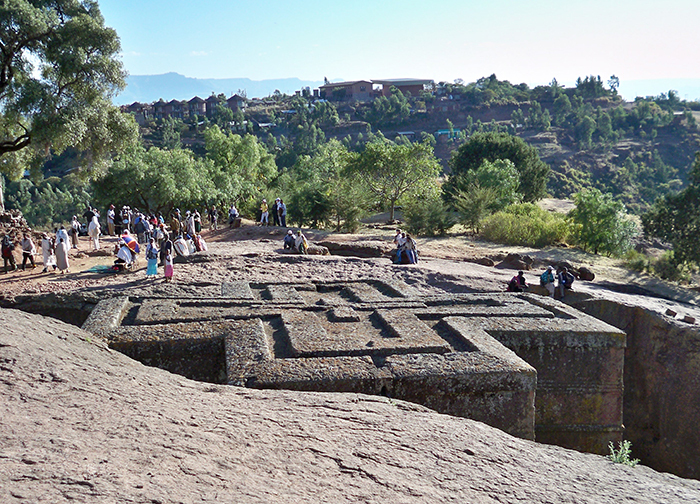 Visit the exquisite church of Yemrehane Kristos Arrive into historic Lalibela. Enjoy a morning excursion by drive or aboard a mule to Asheton Mariam, a mountaintop church with a panoramic view of the Lasta Region. This afternoon, we will finish the expedition to the remaining of the 11 rock churches. Board your flight to Ethiopia's capital city. Visit the ‘Merkato’, the largest open-air market in East Africa. Late this afternoon enjoy a “farewell dinner” and coffee ceremony at a famous traditional Ethiopian restaurant. After sampling the various national dishes and enjoy an Ethiopian Folkloric transfer to the airport. Over 3000 happy visitors and counting!